The problem with many factory-supplied choke tubes is that they are sourced parts, made somewhere on some type of equipment, out of some kind of metal, with tooling that may or may not be worn, and quality control that may not exist. When a manufacturer sources things, often from China, Turkey, or Mexico, the very lowest bidder often gets the order. It is understandable, to a certain extent, for few people buy shotguns based on factory choke tube quality, consistency, or warranty, and as few people pattern their shotguns properly, it becomes something that is rarely confirmed. Though it varies from year to year and has for decades, roughly 1/3 of the shotguns I test do not shoot to point of aim. Some shotguns come with eccentric chokes, though they aren't supposed to. One of the most common problems is mis-marked choke tubes: when a “Modified” choke has less constriction than an “Improved Cylinder” tube, it is a virtual certainty that at least one of those choke tubes will not remotely perform as indicated. If it is marked a certain way from the low-bidding vendor, it gets thrown into the box and none are any wiser. Ignorance can be bliss, at least for a short while. I've known George Trulock and his family for many years. George himself, is constantly battling raw material quality, monitoring tooling wear, inspecting and reinspecting his product to ensure that the next Trulock choke is as good as the one prior. Trulock Chokes also loudly supports the Second Amendment, the National Shooting Sports Foundation, and the National Rifle Association. You might be surprised at the number of entities in the industry that do not. 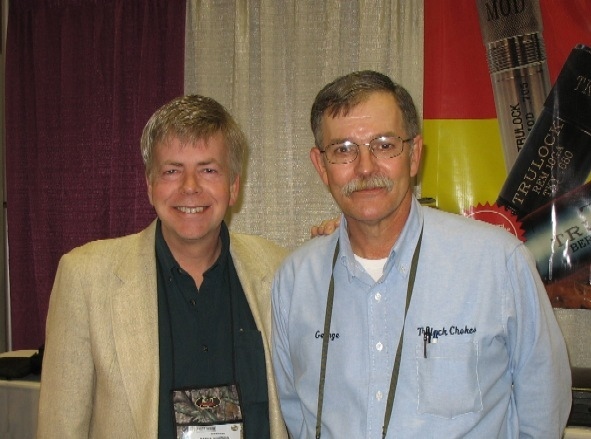 George is the first to suggest that if you want the best performance, it takes a quality choke tube and a quality shell. You can't just have one or the other if you are performance minded. Right now, you can fly First Class with a Trulock “Pattern Plus” stainless steel flush mount choke for $17.99. If you are ordering three or more chokes, you get 10% off. If you order one hundred and twenty dollars worth of chokes, you get a free choke case, and free shipping. If you aren't sure what to order, the Trulock staff at 1-800-293-9402 is happy to help. It doesn't stop there, for if you aren't happy with the choke within 60 days, for any reason, you get a free exchange or a refund: your choice. Beyond that, all Trulock chokes carry a Lifetime Warranty. It has been this way for many years, Trulock pioneered this level of customer service in the industry. If there is such a thing as a risk-free purchase, a Trulock choke is it. There are no bombastic claims associated with Trulock chokes: it is quality of raw materials, quality of machining, and quality of inspection that makes Trulock chokes the most consistent. When new shotshell designs and materials are introduced, Scott Trulock, Jerrod Trulock, and Jamie go to work, experimenting with different designs and constrictions to see how well a specific shell can be optimized. When the R & D is successful, it results in product like the Trulock Black Cloud chokes, the Trulock Federal Heavyweight chokes, and the Trulock Winchester Longbeard XR choke tubes that are dialed in by the shot diameter used. If the testing does not result in measurable improvements, well . . . then no one will hear about it. Scott Trulock invented the “Boar Blaster” choke design, with five parallel steps leading into the parallel section. It works with 00 and 000 Buckshot, yielding 20% tight patterns, or more, vs. the perpetually excellent Trulock Precision Hunter chokes that I personally trust on the vast majority of my hunts. Some years back, I was busy patterning various shells and chokes for an upcoming Iowa turkey hunt. My late father always wondered if I had lost my mind with all the hours spent counting pellets. Well, Dad did try a few shots out of his older Browning Gold 20 gauge, and was disgusted at what he saw. With the addition of a Trulock Heavyweight #7 choke tube and Federal Heavyweight #7 shells, of course, the pattern improvement was breathtaking. 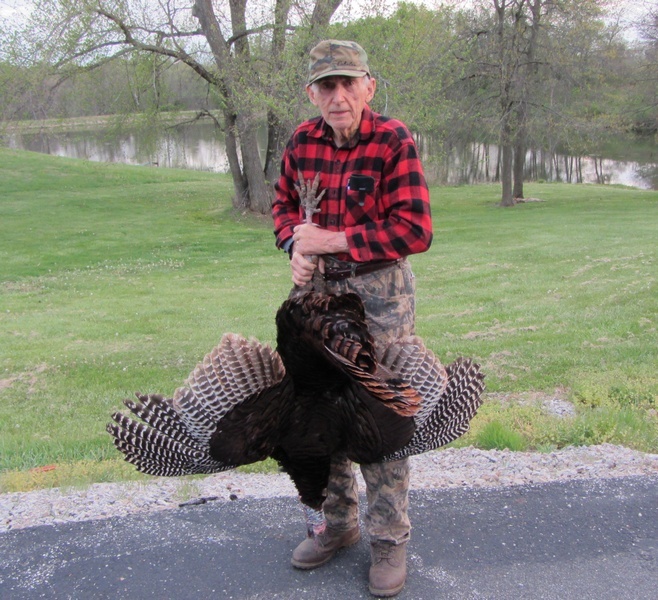 Five years ago, to cite but one example, Dad celebrated his 84th birthday a few days early, bagging this 26 pound gobbler with 1-1/4 inch spurs and a Trulock choke. Dad and I have both been the beneficiaries of the “Trulock School of Fine Dining” for a good long while.